← When Should Management Push Enterprise 2.0 Adoption? 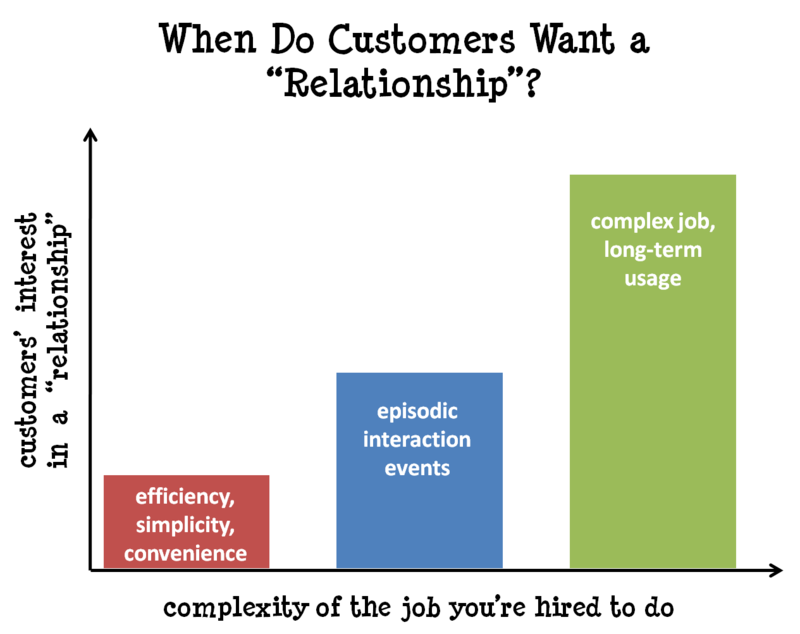 9 Responses to How Much of a Relationship Do Your Customers Actually Want? Regardless, your post is spot on, especially tying the depth of a relationship to the job-to-be-done. The function of the relationship is to facilitate the value of the product/service. Delivering the correct mix of Clayton’s dimensions should be the challenge we need to meet. Thanks for offering this up. Good post. Great post. I think one should also flip it on its head….if a customer wants to have a relationship, you better be willing to engage. Nothing sticks in the mind like being jilted. Somewhere in the nineties Barbara A Gutek wrote a book called the Brave New Service Strategy. She referred to the fact hat service providers once knew their customers personally. And that there was a shift going on from relationships to encounters. Not only in customer service, but also in health care and education. I think that Barbara’s analysis is still very valid and support your great analysis. And indeed if one is working in customer management, one has to think about the consequences mentioned in your post. At last, some true customer-centric thinking allied to the whole evolution of CRM and Social. I couldn’t agree more with the theory. With the advent of social platforms and mobility the whole concept of managing a ‘relationship’ in a high volume transaction space is of limited importance than managing an effective customer experience that delivers immediate value.